Aimpoint Micro red dot sights are some of the smallest, lightest, and most reliable compact red dot sight available on the market. Aimpoint Micros are so light that they add only 100 grams to the weight of a gun, mount included. Blaser mounts also available. 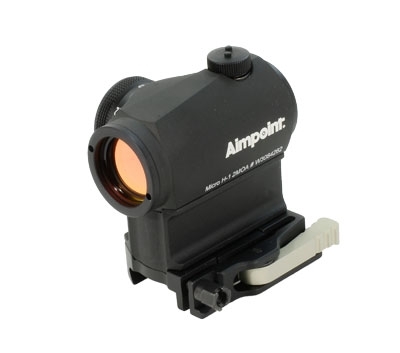 Aimpoint Micro H1: The lightest, most compact red dot sight in the Aimpoint linuep. Available with 2 MOA or 4 MOA dots, the 50,000 hour battery life and 12 brightness settings make it possible to measure battery life in hunting seasons. Suitable for use on rimfire rifles, centerfire magnum rifles, pistols, crossbows, and bows. Aimpoint Micro T1: An upgraded version of the Aimpoint Micro H1 with night vision compatibility and a more rugged anodized coating.